The arrow marks PTF 11kly in images taken on the Palomar 48-inch telescope over the nights of, from left to right, Aug. 22, 23 and 24. The supernova wasn't there Aug. 22, was discovered Aug. 23, and brightened considerably by Aug. 24. 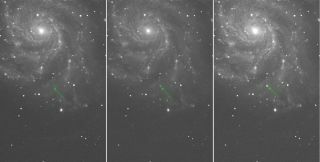 The supernova, or exploded star, flared up Tuesday night (Aug. 23) in the Pinwheel Galaxy, just 21 million light-years from Earth. It's the closest star explosion of its type observed since 1986, and astronomers around the world are already scrambling to train their instruments on it. "PTF 11kly is getting brighter by the minute. It’s already 20 times brighter than it was yesterday," Peter Nugent, of the Lawrence Berkeley National Laboratory and the University of California, Berkeley, said in a statement yesterday (Aug. 25). "Observing PTF 11kly unfold should be a wild ride," added Nugent, who was the first person to spot the supernova. "It is an instant cosmic classic." The survey spotted PTF 11kly blazing up in the Big Dipper, otherwise known as the constellation Ursa Major. It is a Type Ia supernova. These explosions are thought to occur when a dying star called a white dwarf exceeds its weight limit (by accreting mass from a stellar companion, or merging with another white dwarf) and goes boom. "Type Ia supernovae are the kind we use to measure the expansion of the universe," said Mark Sullivan of Oxford University, who was among the first scientists to follow up on the supernova detection. "Seeing one explode so close by allows us to study these events in unprecedented detail." Researchers will be watching the supernova evolve over the next couple of weeks. Catching it so early in its formation and evolution is a rare treat, researchers said. "We are finding new clues to solving the mystery of the origin of these supernovae that has perplexed us for 70 years," said Andrew Howell of UC Santa Barbara. "Despite looking at thousands of supernovae, I’ve never seen anything like this before." This is the closest Type Ia supernova astronomers have observed since 1986, researchers said. And it's getting brighter by the day. Soon, it may even be bright enough to see with binoculars. "The best time to see this exploding star will be just after evening twilight in the Northern Hemisphere in a week or so," Sullivan said. "You’ll need dark skies and a good pair of binoculars, although a small telescope would be even better."